Last Friday evening Lawyer and I had dinner with two friends he met in law school. It was a fun change from our normal stay at home date night so I was super excited to wear my new favorite shirt. 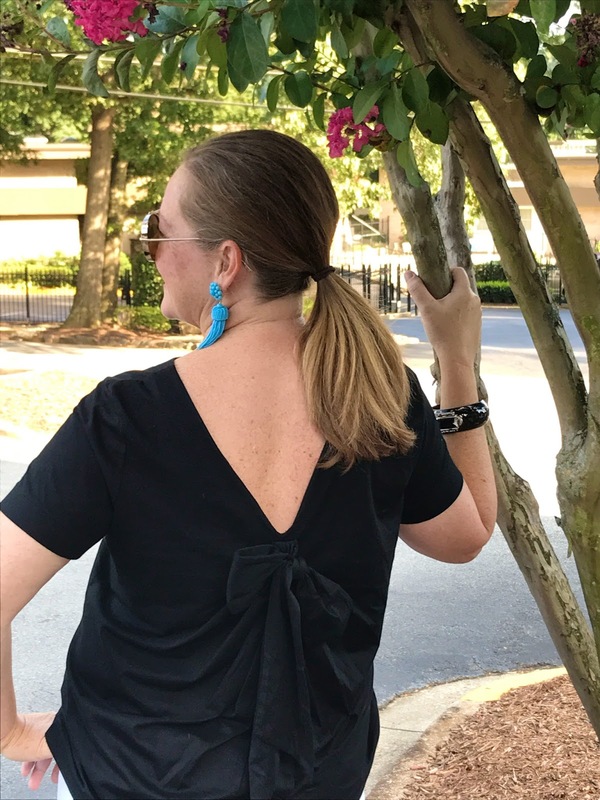 I spotted the top while grabbing some fun pieces for some fall events and this top and I fell in love with this top at first touch. Super soft and fabulously thick it wears well, hangs well and is so comfortable. I might need to live in Supima cotton every day all day. I snagged it up quickly and immediately talked a girl at the register into getting one as well. Since purchasing the shirt I have also purchased the navy one which I will be wearing this weekend. I am super excited for the weekend we have planned, Lawyer and I are celebrating something fun which is always makes for fun times. While I was in the shop I picked up a few other amazing pieces that I am sharing below. Between events in September, two trips in October and a full holiday schedule I am getting a jump on my shopping for some basic but fabulous pieces to wear. I am very attracted to navy and navy stripes at the moment so I am finding I am gravitating a lot to this color way. I will need to pair them with some fun bottoms to add some spice to my outfits. But I am up for the challenge! Oh and hurry ... this top and this top are on flash sale today for amazing prices!